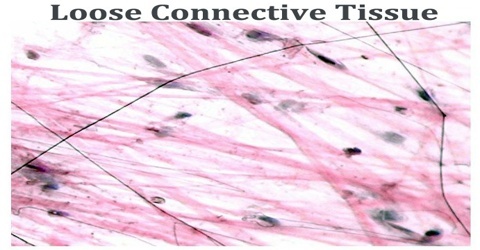 Loose connective tissue is a loose, irregularly arranged connective tissue that consists of collagenous and elastic fibers, a protein polysaccharide ground substance, and connective tissue cells. It is a category of connective tissue which includes areolar tissue, reticular tissue, and adipose tissue. In order to perform its function, connective tissue has certain distinct components, such as cells and fibers. The proportions and organizations of the fibers result in several types of connective tissues, one being loose connective tissue. an abundance of different types of fixed and wandering connective tissue cells. This type of connective tissue proper, with the help of its extracellular fibers, tightly binds epithelia to underlying tissue and physically supports the blood vessels and nerves that supply the subepithelial area. Three types of loose connective tissue are recognized. 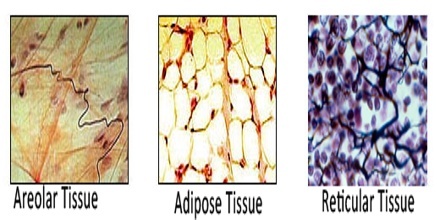 These include areolar, adipose, and reticular types. Areolar tissue is a common type of loose connective tissue and the most widely distributed type of connective tissue in vertebrates. It is so named because its fibers are far enough apart to leave ample open space for interstitial fluid in between, areola is Latin for a “little open space”. It is strong enough to bind different tissue types together, yet soft enough to provide flexibility and cushioning. Loose connective and adipose are common as supportive wrappings for glandular structures, hair follicles, blood vessels, nerves, and other structures. Elasticity is one important attribute of adipose and areolar types. Shock absorption is a second key attribute of adipose and areolar connective tissues. Around organs such as the kidneys loose connective tissue types act as vibration dampening supportive tissues. In complex joints, adipose pads also serve this purpose. Finally, adipose is an important energy storage tissue surrounding active organs such as the heart, kidney, certain glands and in bone marrow areas. Reticular connective tissue is supportive tissue making up the framework of glands, organs, and lymph nodes. Special stains are usually required to see the fine, branching collagen fibers making up reticular connective tissues. 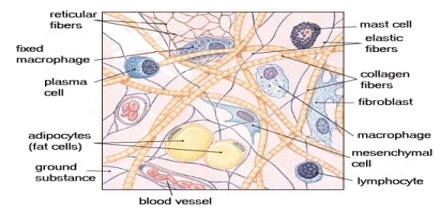 In glands and organs, secretory epithelial cells are attached and anchored to this network of fibers. Areolar connective tissue is strong enough that it can bind different tissue types together (such as our skin to our muscles) but also soft enough to provide a cushion for our organs. This tissue is important because it has several jobs in our bodies. It also serves as a reservoir of water and salts for surrounding tissues. Almost all cells obtain their nutrients from and release their wastes into areolar connective tissue. 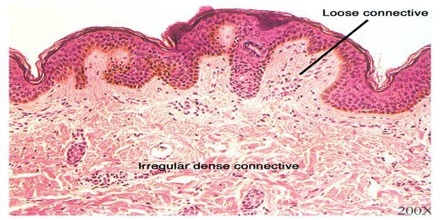 However, loose connective tissue is primarily ground substance and cells, its overwhelming functions are related to these components: loose connective tissue serves as the principal site of rapid fluid and gas exchange between blood and local tissue and the medium in which the fluid infiltration and cell migration of the inflammatory response takes place. Loose connective tissue has an abundance of all the fixed and wandering cells connective tissue proper cells. The most abundant cell type present in loose connective tissue is the fibroblast. Fibroblasts produce and secret the organic components of the amorphous ground substance and extracellular fibers of the extracellular matrix. The other cells present in loose connective tissue are involved in inflammation and immunity, making loose connective tissue the principal theatre of inflammation in the organs of the body. Reference: histologyolm.stevegallik.org, mhhe.com, dictionary.com, wikipedia.